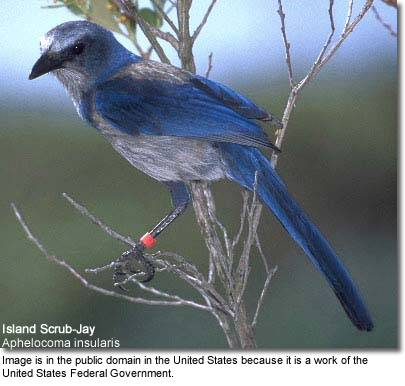 The Island Scrub-Jays (Aphelocoma insularis) - also known as Santa Cruz Island Jays or, simply, Island Jays - are only found on the North American island of Santa Cruz off the coast of Southern California. Island Scrub Jays are close relatives of the Western Scrub-jays (from adjacent mainland of California) and the Florida Scrub Jays. However, according to DNA studies - the island birds has long been isolated from the mainland relatives as exemplified by distinct physical differences. These birds are found on the Santa Cruz Islands, which is the largest of California's Channel Islands and is situated off the coast of southwestern California, USA. Island Scrub Jays live in wooded areas throughout the island, but are particularly common in canyons and north-facing slopes dominated by Quercus (oak) trees. There are no indications that these jays have ever been outside their limited island territory; and therefore, these are among the most range-restricted songbirds in North America. Previously, about 9,000 of these birds were believed to exist on the island. However, a survey conducted from 2008 to 2009 suggested that fewer than 3,000 of them have survived, with less than 1,000 breeding pairs. Even though there is no clear indication of decline and the population appears to be stable at this time, this species is now listed as Vulnerable by the International Union for Conservation of Nature. They are at risk of extinction because of the limited range and population size, emerging threats from wildlife fires, habitat destruction by introduced pigs and sheep, climate change and disease. Of particular concern is the West Nile virus, which arrived in mainland southern California in 2003, but has not been identified on Santa Cruz Island. However, since this island is only about 18.7 miles or 30 km away from mainland California, this remains a great concern. Their numbers could also be decimated by introduced rats, which are absent from Santa Cruz Island, but do occur on other Channel Islands. Rats will prey on their eggs and chicks, and have been the primary cause of extinction of other wildlife. 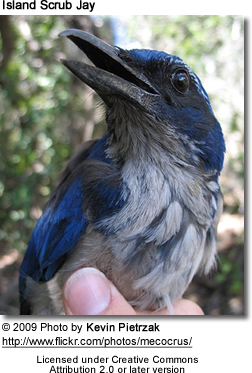 Western Scrub Jay: Smaller. Not as brightly plumaged. Bill stouter. Separate ranges. Island Scrub Jays feed on the thick-shelled acorns of the Island Oak. They are known to bury these acorns at a time when they are plenty for retrieval at a time of the year when they are not readily available. They also eat other seeds, insects, spiders, snakes, lizards, mice and - on occasion - the eggs and nestlings of other birds. Pairs are monogamous, typically remaining together for life. However, they will replace a mate that was lost. Both the male and the female construct the nest out of twigs and rootlets. The nest is lined with soft grasses, feather down and mammal hair. The female lays 3 to 5 eggs for about 18 - 20 days. The nest is placed 3 - 26 feet (1 - 8 meters) above the ground. The parents jointly raise the young.